The Society invites contributions for future volumes of Libyan Studies. Manuscripts and illustrations can be posted or emailed at any time, as articles will appear on the Web before the print publication, through Cambridge Journals Online’s First View . The deadline for the 2018 publication (Volume 49) has now passed. Articles for the 2019 publication (Volume 50) can now be submitted up until January 2019, including book reviews. Or click here to use the file upload facility on the Contact Us page of this website. Libyan Studies is published annually in November in printed form. The Society now makes articles available as soon as they are ready for publication, without waiting for the issue to which they belong to be published. These articles are called ‘First View’ articles and can be viewed here: Cambridge Journals Online. 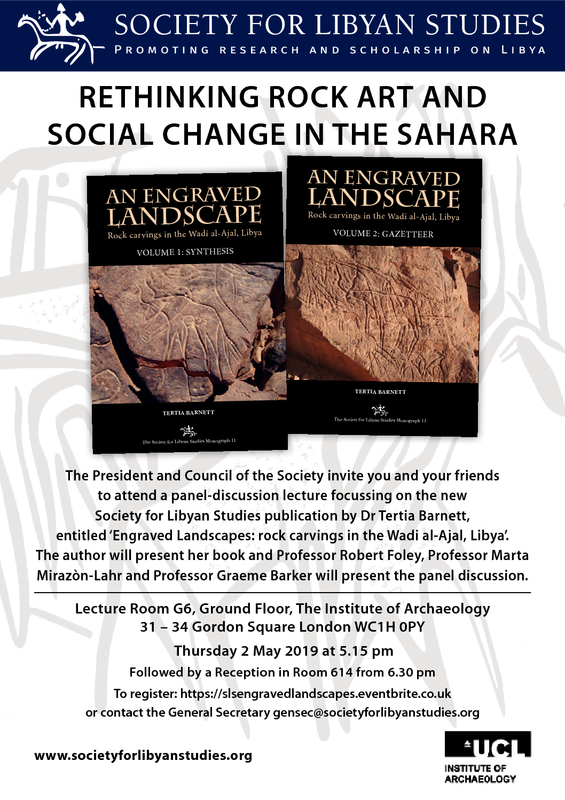 Coverage includes current research on all aspects of Libya, particularly on archaeology, history, and related aspects of the natural environment. The editor is willing to consider contributions on related topics in respect to other parts of North Africa, including the Sahara as a whole and the Maghreb. Contributions may take the form of research articles, shorter notes, reports on archaeological fieldwork, and book reviews. Articles and shorter notes must reach the editor at the latest by 31 January each year for the print publication for that year, but articles are accepted throughout the year and may appear online before the print publication if they are ahead of the 31 January deadline. In all cases, authors are advised to notify the editor in advance of submitting copy. Authors should submit one digital copy to the editor. Digital copies should be submitted as an email attachment. The editor will acknowledge all contributions received. Submissions will be reviewed by at least two referees before acceptance. Authors and referees will remain anonymous unless otherwise requested. Recommendations made by referees will guide the editorial decision. The final decision is made by the editor. Following review, the editor will notify authors of the decision, and will forward recommendations by referees. Authors of accepted manuscripts will receive one set of proofs (in August/September for the printed publication, or before), which should be corrected and returned immediately. Authors who are likely to be abroad or otherwise unavailable at this time should contact the editor. The style sheet is intentionally simple, and what is important is that authors are consistent with their style. Slight deviations from the Libyan Studies house rules may be acceptable. The Society is conscious of the time wasted formatting articles and does not want to add unduly to the work already being undertaken in writing the article. The preferred length of contributions is 3,000 to 8,000 words. Authors who wish to submit larger contributions should contact the editor. Authors are requested to include a cover sheet with their name, postal address and email address. An abstract of not more than 100–200 words is required for all articles, notes and archaeological reports. Abstracts should be provided in English (for translation into Arabic and for wider publicity in various abstracting journals). The abstract should be a factual summary of the contents and conclusions of the paper; it should not form part of the introduction. Text should be typed double-spaced in 12 pt font on one side only, with a 4 cm left hand margin. All pages should be numbered in the bottom right-hand corner. Paragraphs should be justified, separated by a single line space, and not indented. Where Greek and Arabic text, inscriptions, and transliterations are provided, authors must supply the font file. An English translation should be provided where possible. Use of headings should be limited to two levels only. Headings should be typed on a separate line. Primary headings should be in bold font, secondary headings in italic font. In general, abbreviations should be punctuated: ed., e.g., etc., fig., i.e., n., no., pl., p. 20. However, abbreviations in plural (eds, figs, ns, nos, pls), contractions (Dr, Mr, Mrs, St), and series of initials (MA, PhD, UK) should omit stops. When used in text, abbreviations should be written in full: ‘for example’, ‘as illustrated in Figure 1’. Spell out numbers one to ten, except when in sequences or as measurements. Numbers over ten are to be printed as numerals except at beginning of sentences. Use commas to indicate places. Roman numerals are to be avoided where possible. Ordinal numbers are to be spelled out in text: ‘during the eighth century’, ‘the second phase’. Measurements should be in metric units: 4 cm, 5.3 m, 2 km, 7 ha, 14 g, 6 kg, abbreviated without stops. Where it is necessary to preserve imperial measurements then metric equivalents should be provided in parenthesis: ‘extended 8 yards (7.3 m)’; ‘34 inches (0.86 m)’. Dates should be expressed as follows: 620 BC, AD 1340, AH 620, tenth century AD, fourth century AH, 14 July 1764, the 1890s, 211–202 BC, AD 1911–15. Radiocarbon determinations should be given with calculated error to one standard deviation, and with the laboratory reference cited: 5,050±110 BP (GrN3451). Calibrated dates should use the form Cal BP. In a sequence, the last two digits only should be given in the second element, except when the first of the two digits would be a zero: 1–13, 19–22, 124–35, but 104–108. British English spelling should be used throughout. Spelling of names should be standardised within each contribution. The editor reserves the right to modify spelling. References should use the Harvard (author/date) system, and should be placed in the main text: ‘it has been shown (Goodchild 1950, 35)…’ Goodchild (1950, 35) has shown….’ With two or more references by the same author in the same year: (Goodchild 1950a; 1950b). For more than two authors: (Goodchild et al. 1950, 31–35). Where several works are referred to at the same time, list them alphabetically rather than chronologically: (Barker and Jones 1984; Barth 1857; Goodchild 1976). Do not abbreviate classical source references: (Tacitus, Annals, 4, 72). The use of notes should be avoided if possible, but if used, please use endnotes. References in notes should follow the Harvard system. Endnotes should be referenced in the main text by superscript numbers and should be placed after punctuation. An alphabetical list of references referred to in the text or in endnotes should be provided at the end of the text (excluding classical sources). Authors must ensure that references are accurate and complete. Book references should contain author’s name, date, title, publisher, and place of publication. Periodical titles are to be spelled out in full. Periodical numbers are to be given in Arabic numerals, not Roman. – Hamilton, J. 1856. Wanderings in North Africa. John Murray, London. – Goodchild, R.G. 1950. The limes Tripolitanus II. Journal of Roman Studies 40: 30–8. – Brehony, J.A.N. 1960. Semi-nomadism in the Jebel Tarhuna. In Willimott, S.G. and Clarke, J.I. (eds), Field Studies in Libya. Department of Geography, University of Durham, Research Paper 4: 60–69. See also previous journal articles for more examples. Figures should be numbered in consecutive order, and be accompanied by a caption. A single system of numbering is used for both line drawings and photographs. Captions should identify the source of a figure. Figures must be sent as separate digital files, preferably as TIFF or EPS files. Line art figures should be submitted at a minimum resolution of 1000 dpi (TIFF) or 1,200 dpi (EPS). Greyscale figures should be submitted at a minimum resolution of 300 dpi (TIFF). Resolution at less than 300 dpi will not be accepted. Please note that images are printed in black and white, but you can submit colour images for the online version. In this case, please provide two images, one converted to greyscale and the other in colour. It is essential to provide a black and white image as details can be lost in the automatic conversion from colour to black and white, and authors may thus need to make changes to the black and white version for clarity. The maximum area available for figures and captions is 20.5 cm × 15.2 cm. Where possible, figures should be submitted at the size you wish them to be printed – particularly important when there are scales. It is also helpful to specify preferred page size – e.g. half page, full page. Please also click here to see the latest Cambridge Journals Artwork Guidelines for illustrations, pictures and other artwork (such as multimedia and supplementary files). Tables should be numbered separately to figures, in consecutive order, and be accompanied by a caption. Tables can be submitted either as separate Microsoft Excel files, MS Word tables or as plain text files using tabs between columns. In their interest, and in accordance with the practice of most learned journals, authors are asked to assign copyright of their text and illustrative material to The Society for Libyan Studies. Authors are responsible for obtaining permission to use any illustrations or prose/poetry extracts, and for paying any reproduction or copyright fees. Permission must be sought to reproduce illustrations and text in electronic form as well as in print form. Copyright in the UK extends over the life of the author and seventy years from the end of the year in which the author dies.